The interior of 54m hull no. 10231 is for the first time revealed by Baglietto and looks astonishing. Horacio Bozzo Design is responsible for sleek and catchy lines while the Italian Hot Lab firm designed the interiors. Thanks to the skillful use of uniform pale and natural colors the yacht has a real Italian flair. Enriched by the use of precious materials and rich details gives in the Owner and his guests, a sense of wonder discovering new secrets hidden behind every single element. The Italian marble is greatly used as a tribute to the Italian architectural tradition. It is used as a decorative element of extreme beauty and is enhanced by the different use of sandy-colored woods, precious leather, brass and lacquered panels. The result is a modern and cozy interior décor. The naval engineering is from Baglietto: “The displacement hull #10231 is based on a brand new naval platform expressly tailored for this project. – said Michele Gavino, Baglietto’s CEO - and we are very proud of it. During the tank tests we carried out at the CNR’s ship model basin in Rome we achieved the highest performance with smaller engines, less- consuming: an advantage for everybody also in terms of environmental impact”. Conceived for a large family it offers a layout which includes 2 master cabins on the main deck, 4 guests’ cabins on the lower deck and many areas that are customized specifically for the younger guests. The Owner has strictly worked in connection with the designers following two different sources of inspiration: “one more fresh and informal – states Enrico Lumini, Hot lab’s Interior Chief Designer – dedicated to the main salon and exterior areas; the other more elegant and refined for the private areas, the cabins and the formal dining room which is located on the upper deck’s sky lounge”. Finally, the great use of floor-to-ceiling windows and natural light all over the boat –a signature of Baglietto – resulting in the perfect combination between exterior and interior design. The vessel in all aluminum will have a 10.40 m beam and 2.60 m draft with a transatlantic range of 4,500 nautical miles at a cruising speed of 12 knots and she will be in the highest class of Lloyd’s Register of Shipping. The hull no. 10231 is an example of Baglietto’s total flexibility and takes advantage of its fully-custom production. To date, there are 5 yachts under construction at the modern La Spezia shipyard: a 43 m Fast Line HT; a 55 m yacht designed by Francesco Paszkowski Design, to be completed in 2019; a 54 m craft and a 40 m vessel, both with exteriors designed by Horacio Bozzo and interiors by Hot Lab and Achille Salvagni, respectively, and both to be delivered in 2020; and - last, but not least - the production on speculation for a third 48 m model in the T-Line, the sister ship of the Silver Fox, has been initiated, with delivery is expected in 2020. 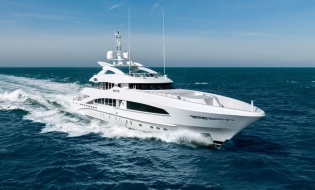 Heesen is delighted to announce the delivery of YN 18250 White.